That scene was *totally* an alternate timeline version of the final episode, in which the villains had taken over every other planet in the universe. And then Team Dai-Gurren fired upon THE WHOLE UNIVERSE. YEAH. Also, there could be spoilers above. I think most of them will only make sense once one has learned them in the show, though. @The One Guy: Naturally, it would be impossible to figure out the challenge based on remembering the old page. I don't do memory challenges. I do logical-thinking challenges. The leaps of logic went something along these lines: they're planning to stop Jane from making the second plot hole. They're therefore headed for #142, since that's when that plot hole was created. 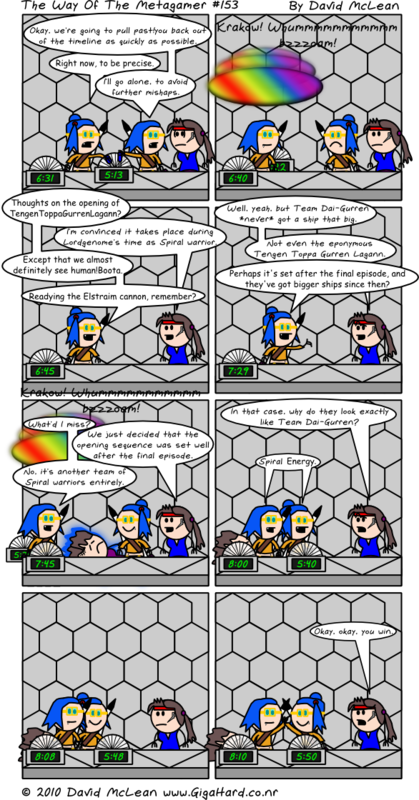 However, the GIGAHERTZ units got shuffled around a bit, which, when combined with Trope-tan's lack of experience in configuring the device, meant that they missed #142 entirely (this bit was obvious from the fact that they didn't appear on #142). Admittedly, the final point was a really tenuous leap: they missed #142, and one may assume that they did so by a round figure; as indeed they did, by the nice round number of 100. @snowyowl: Schedule is M-W-F. My ability to keep to said schedule is anything but regular, however. :( As for checking for the updates, I have an RSS feed. And email notifications. Just started reading your comic recently, and remembered reading 42 after the change, but 43 before the change. I happen to catch the archives RIGHT before you changed them! The whole time I was reading, I was thinking "Is the author going to remember that thing he did back in comic 42 years ago" not knowing you made the change later. Great stuff! I just realized I got confused with my comment to the previous comic. I said I finished reading before the comics were changed, but at the time I had thought #42 was blatant foreshadowing put in at the time. Now I realize I was in the same situation as Kermit, and I now know why it took so long for people to guess when they went back to; they had never read the replacement strip, so they couldn't possibly have remembered where it was, or even known it was there! How many unique visitors do you have to this site? How popular is this comic? With all due respect, do you have a regular update schedule or should I just keep checking back here every 10 minutes? RSS feed, you say? Thanks! Trope-tan: Okay, we're going to pull past!you back out of the timeline as quickly as possible. past!Trope-tan: Right now, to be precise. Trope-tan: I'll go alone, to avoid further mishaps. past!Trope-tan: Thoughts on the opening of TengenToppaGurrenLagann? Jane: I'm convinced it takes place during Lordgenome's time as Spiral warrior. past!Trope-tan: Except that we almost definitely see human!Boota. Readying the Elstraim cannon, remember? Jane: Well, yeah, but Team Dai-Gurren *never* got a ship that big. Not even the eponymous Tengen Toppa Gurren Lagann. past!Trope-tan: Perhaps it's set after the final episode, and they've got bigger ships since then? Jane: We just decided that the opening sequence was set well after the final episode. Trope-tan: No, it's another team of Spiral warriors entirely. Jane: In that case, why do they look exactly like Team Dai-Gurren? Jane: Okay, okay, you win.